Manus Machina's pair of wireless hand tracking gloves are coming to every major VR headset when they launch in 2016. The $200 Bluetooth VR gaming accessories don't use a proprietary tracking system, they integrate with existing ones such as Oculus' constellation tracking and Valve's Lighthouse tracking system. The gloves, which weigh just 42g each, track each finger individually using integrated flex sensors as well as motion sensors to accurately track hand movement. Manus Machina is also working on integration with the Samsung Gear VR headset, the only VR device that's currently on sale. And Manus Machina recently revealed to VRFocus that it is working closely with OSVR's Hacker Dev Kit headset. 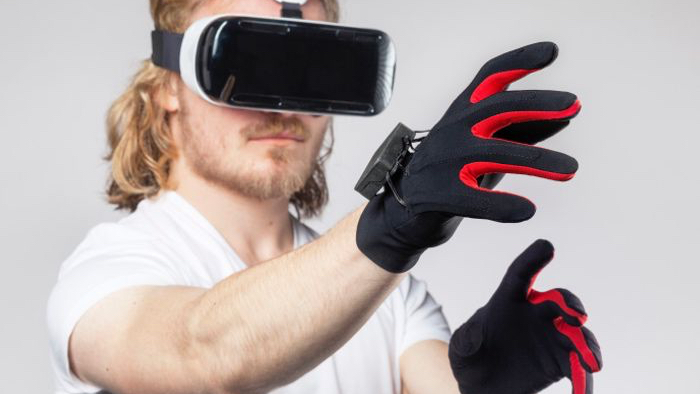 In June, the company was added to the list of partners in the Open Source Virtual Reality ecosystem and since then it has been working with the OSVR headset's IR tracking to add it to the Manus glove design. Rival input accessories for tracking our hands include Leap Motion which has an OSVR faceplate accessory to allow it to work with the headset and, of course, the headset manufacturer's own controllers such as Oculus Touch and HTC's prototype controllers for the Vive. The Manus Machina dev kit will be available for $280 and the consumer gloves will launch for around $200 in the first half of 2016.